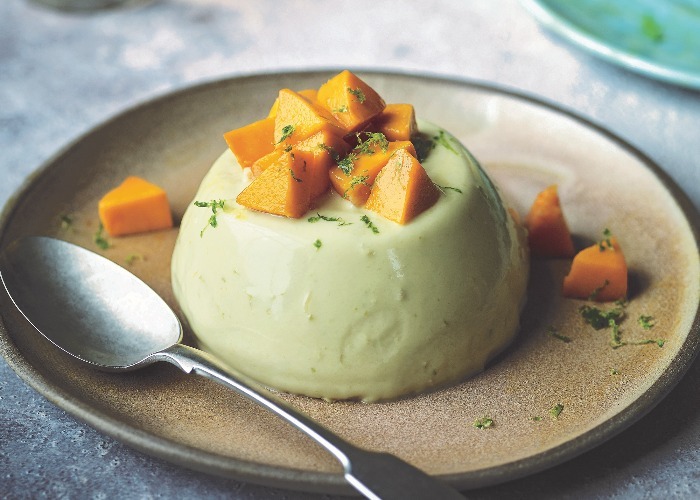 Fresh and creamy flavours combine beautifully in this simple but outstanding dessert. It’s not too sweet and will never fail to please, thanks to the mango purée and lime zest. Put the gelatine into a bowl of cold water and set aside to soak. Combine the milk, double cream, coconut cream and vanilla in a saucepan and bring to a simmer over low heat. As soon as the mixture begins to bubble, take it off the heat and add half the lime zest and the sugar. Whisk well to dissolve the sugar. Squeeze the water from the gelatine leaves and add them to the hot cream mixture. Whisk again until the gelatine dissolves, then add the mango purée and whisk again. Pour the mixture into 5 ramekins, then transfer to the refrigerator and leave to set for 2–3 hours. Turn out the panna cottas on to serving plates. Top with the fresh mango, sprinkle over the remaining lime zest and serve chilled.